The fin and rudder were entirely scratch built as it wasn’t worth trying to convert the kit parts. As with the tailplane elevators, they were made from brass wire and sheet suitably annealed and bent to shape and the kit’s fullsize plans were used to ensure the shape was accurate. 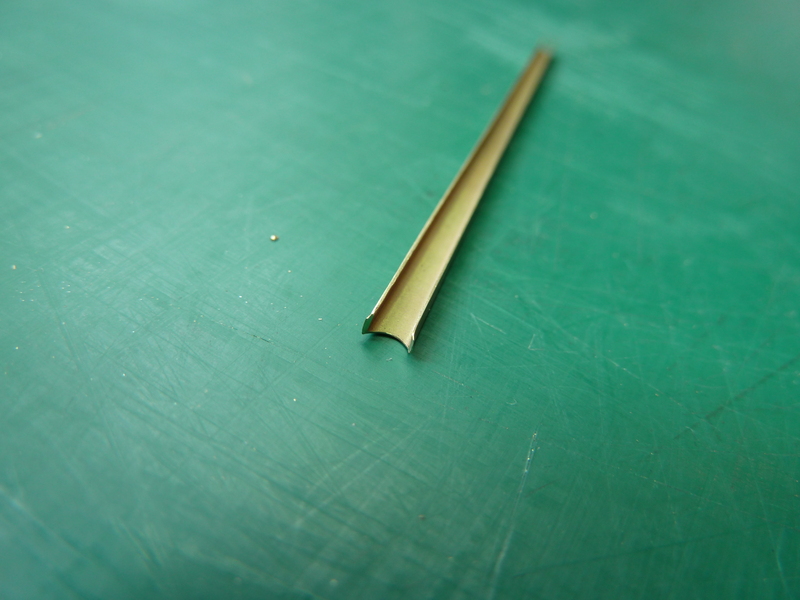 Web for the rudder bent from brass sheet. The hinges were made in the same way as the elevators and all joints were soldered. My soldering isn’t that fantastic and the end result is more a reflection of my ability to clean the joints up afterwards. 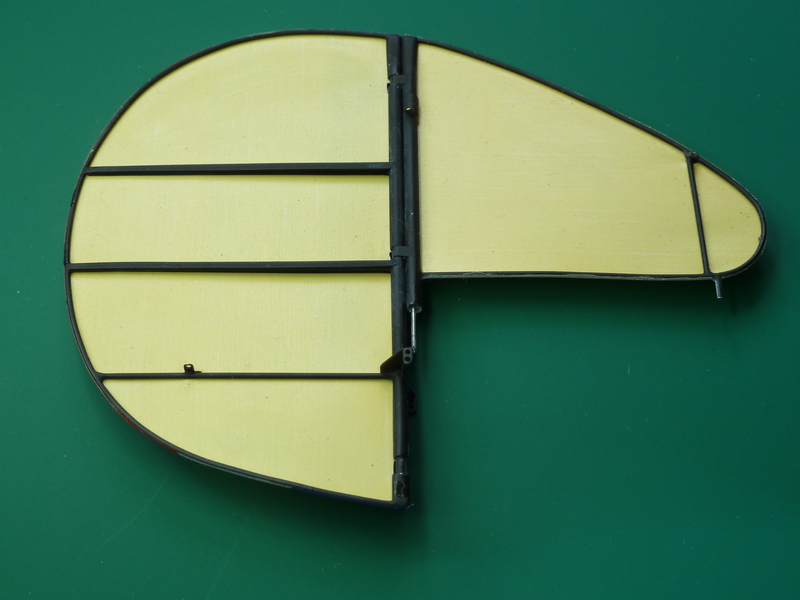 Scratch built rudder and fin. 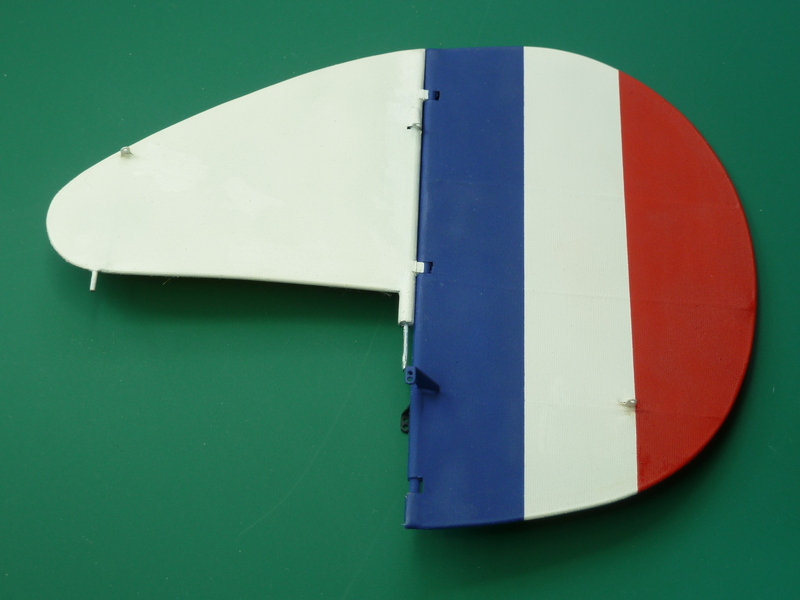 Fin and rudder attached to the kit’s sternpost. Covering of the fin and rudder was again done using ‘Antique’ Solartex. The assembly was first primed and then sprayed black before the material was finally ironed on. 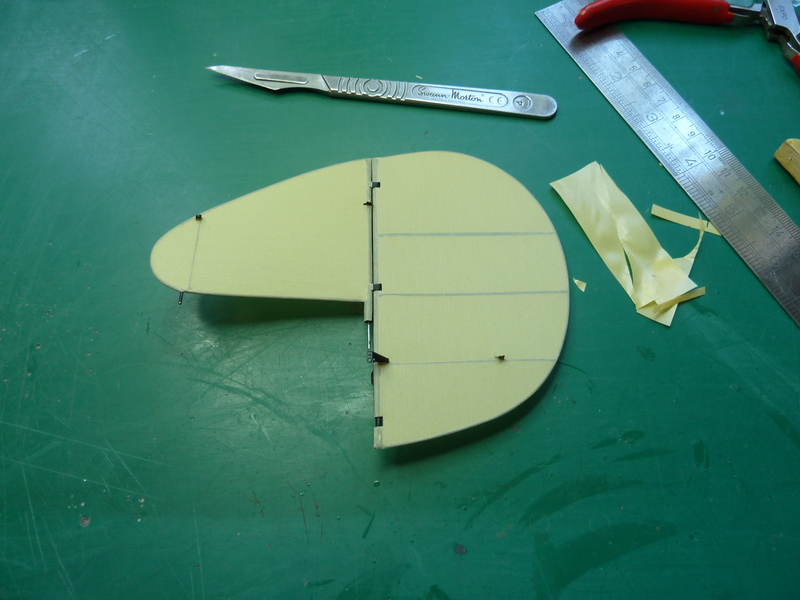 The process was slightly more difficult than the tailplane because the one side of the rudder was to be left bare. This meant a very neat edge had to be achieved around the wire rim. This was achieved by fixing and shrinking the Solartex in place then cutting around the edge carefully and sealing it down with the iron. Time consuming, but not that hard. After covering, the aassembly was painted with Humbrol enamels and coated with a clear satin varnish. 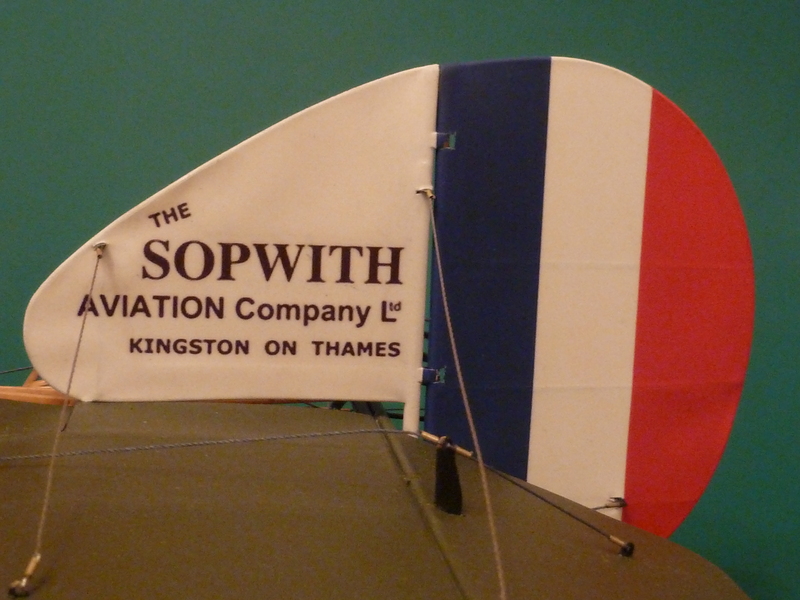 The fin itself was then finished with a high gloss varnish in readiness for the application of the ‘Sopwith Aviation ” decal. The actual logo was obtained from an example on the net and manipulated in Photoshop until it was the right size. The decal was produced by printing the image onto clear inkjet decal paper and sealing it with more clear lacquer. It was then applied like a normal decal using Micro sol and Micro set. After it had dried for a few days it was covered with clear satin varnish to match the rudder..
As an aside, I count myself lucky to have worked for a short while at the old Sopwith factory in Kingston On Thames. Not the original in the centre of town, but the expanded one by Ham Common. It was BAe Kingston at the time and turning out Harriers and Hawks. It was great to be able to walk out of the Systems Design Dept. into the factory and look out over the production area where Pups, Camels, Snipes and then all the inter-war Hawker aircraft were made. Also the Hurricane of WWII fame and the Hunter which came along post war. So many famous aircraft and so much history was made there and I caught it in it’s final days. It has all been demolished now, even the lovely office building, and is a housing estate which saddens me a little, but it had become a bit of an odd place to build aircraft. So that was the fin and rudder. Now on to the core of the model: the fuselage. I use the same technique for my home made decals.